Last week when the first Vera Rubin Ridge drill-hole attempts turned out to be too shallow at "Lake Orcadie", discussion in the team turned to the question of, "How hard is that rock? Is there a way to know before starting the drill hole how hard the rock will be, so we can anticipate whether Curiosity's new drill technique will be successful?" It turns out that the rover team has several indicators of rock hardness: a) retention of natural features such as craters, b) the imprints of wheel marks on the rocks, when we see them, c) scratch marks from the DRT brush, and d) laser pits from ChemCam. This turns out to be a lot of data, especially from ChemCam and MAHLI. However, no one has yet made a quantitative study of rock hardness vs. apparent laser pit depth or brush scratches. The problem is that other factors can affect how deep the pit or scratches look in our images, especially including lighting angle and rock texture and color, but also, for the laser, the distance from the rover and the focus quality. Even so, a study to determine apparent laser pit depth or scratch depth vs. hardness may be useful. The classic Mohs mineral hardness scale was developed over 200 years ago, based on ten readily available minerals ranging from talc (hardness of 1) to diamond (hardness of 10). It is still used because of its simplicity-you can buy a kit with each of the representative minerals and try using them to scratch the mineral that you want to test. However, for quantitative measurements, most studies use the Vickers scale, which was defined 100 years ago and is reported in kg per square mm. It is traditionally measured by the size of the indentation left from a diamond tip with a given force applied. Meanwhile, back on Mars, Curiosity will be driving away from this hard-rock location, with the first drive since Sol 1962, planned to go backwards for 30 meters in a northeasterly direction. Prior to leaving this site, ChemCam and Mastcam will make one more observation each of a meteorite, "Ben Nevis_2." 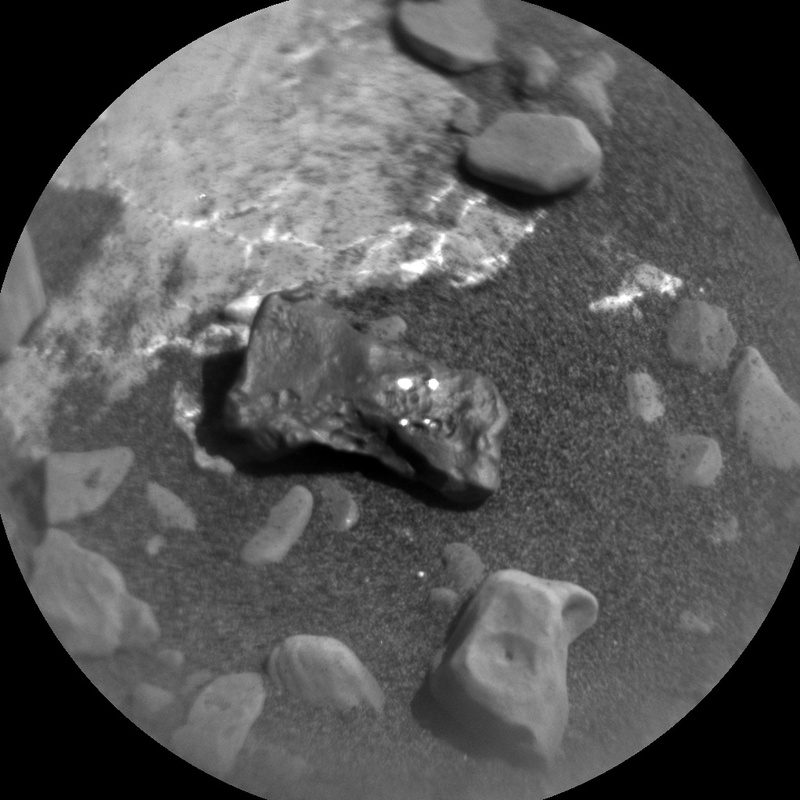 The accompanying image shows the small iron clast with four bright glints, which are sunlight reflections off the metal made bare by previous ChemCam laser shots. Mastcam will also make crater rim extinction and basic tau (atmospheric visibility) observations. After the drive Mastcam, Hazcam, and Navcam will document the new rover surroundings. Navcam will take a zenith movie and a 360 degree observation. Mastcam will also take a clast survey image, ChemCam will take an RMI mosaic of the Yardang portion of Mt. Sharp, and will use AEGIS software to select an outcrop target near the rover for chemical analysis. DAN, MARDI, RAD, and REMS will also take data.